Baby’s safety is the first responsibility of parents. Being a parent is the world’s best feelings I think. If you are parents then you have lots of duties like your babies feeding, clothing, diapering, outing etc. And I’m quite sure that you love a lot doing your duties. For your perfect and careful parenting here I listed some tips. Hope it will help you to use your baby’s stroller safely. 1.6 How can your baby be safe in a stroller? Do you want to buy a stroller? Then please follow the tips seriously at the time of purchase. At first check carefully the selected stroller are enough strong or not before buying. Choose a strong body frame, comfortable seat, easy steering and definitely a secure footrest. You can choose a stroller with car seat, it is quite good for baby as far I know. Make sure that the finest balance should have among shoulder, waist and leg position. The Canopy of stroller should be enough in size. It can easily protect your baby from strong sunlight and unexpected raindrops. Before taking final decision check the strength of handlebar and hand breaks. Don’t forget to check the strength of lap belt also. If you are a parent of more than one child or have twin baby then take a second thought before purchase stroller. Because double stroller will be your smart choice I think. You will get various strollers for twin baby and for infant and toddler. You have just chosen your one. Try to find the comparable lightweight stroller. It will help you for easy moving. Even one more benefit of the lightweight stroller is that you can easily take baby along with you at your jogging time. 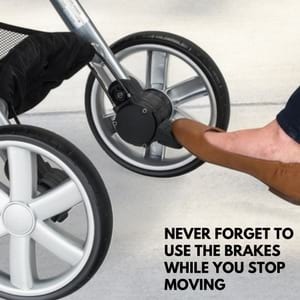 The brake is one of the most important parts of a stroller or a pram. Before each use check the condition of a break. It must be very easy at the time of applying. Never forget to use the brakes while you stop moving. To get a nice grip on braking, tire plays an important role. So check your stroller’s tire regularly. There is an option or feature of disc brakes in few models of a stroller. You can choose this kind of stroller if you want to move unsmooth surface or hills with your baby. If your baby is riding in a stroller then never forget to use the safety harness. It will protect your baby and give him/her an extra balance while turn over or fall. This safety harness can prevent the baby from tumbling out at the time of moving on stairs. You can take a choice of five-point safety harness instead of three-point variation. 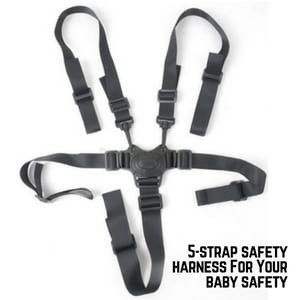 This five-point safety harness will make an excellent balance over the baby’s shoulder, posture and between his/her legs. This harness is also effective for newborn babies. 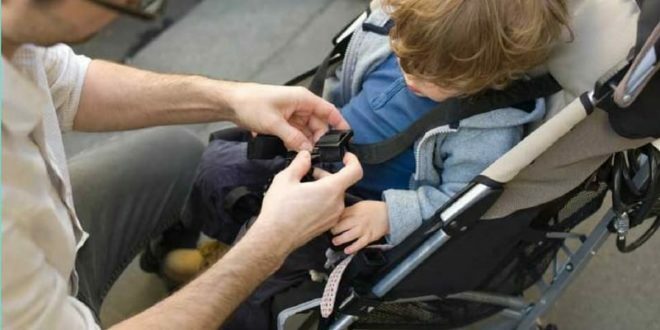 Most probably you will get these harness tools along with the stroller. But if not, then please don’t be the delay to buy all these separately. 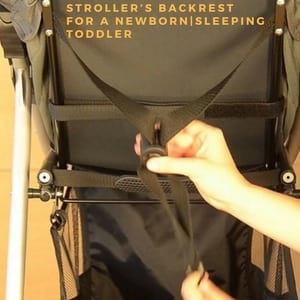 For a newborn baby, Backrest of stroller should be able to lean as completely flat. Otherwise, it cannot give a good support to the baby’s head, neck, and back part. Within few month babies backbone will become gradually strong. Then he/she start to use upright seat and try to sit up by taking support. Every stroller, pram or any kind of baby carrier has a certain weight limit. Check this weight limit before purchase. If baby’s weight is heavier than more capacity to hold then the stroller may become unstable. Do you have two babies? Then please use double seat designed stroller for them. Don’t try to sit both babies on a single designed stroller. How can your baby be safe in a stroller? The most important factor in using Baby Stroller is awareness. Baby equipment can make your daily life easier but an accident can happen anytime for your little ignorance. Do not regret later, therefore, it is important to keep awake all the time, especially every parent. Follow the safety tips discussed and stay safe with your baby.